During November 2008, a salvage excavation was conducted at the Pre-Pottery Neolithic A site of Bir el-Maksur in the Lower Galilee (Permit No. A-5541; map ref. 22125/74150), in the wake of widening Road 79. 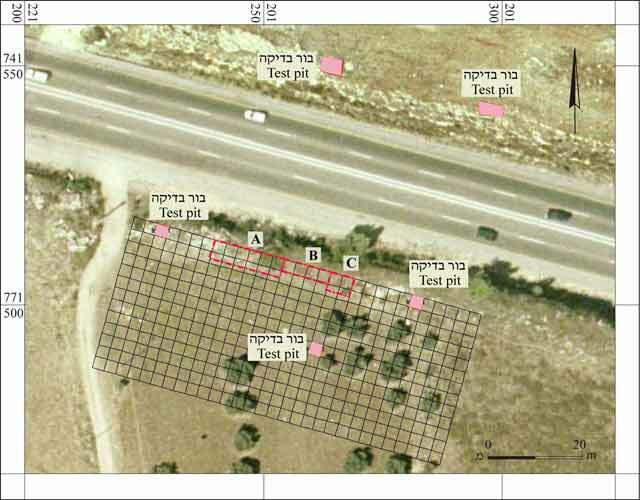 The excavation, undertaken on behalf of the Israel Antiquities Authority and underwritten by the National Road Company, was directed by A. Malinsky-Buller and E. Aladjem, with the assistance of A. Shapiro (GPS), R. Yeshurun (archaeozoology), and Y. Givol-Barzilai (physical anthropology). Further assistance was provided by T. Horowitz of the IAA northern district, Y. Gekcht and R. Ekshtain. The site is topographically located on a hill brow, 226 m above sea level, which slopes to the southeast. The site lies 12 km west of Nazareth and c. 20 km east of the current seashore. The Pre-Pottery Neolithic B site of Yiftah’el is c. 2 km away from the site (Fig. 1). The salvage excavation (36 sq m, thickness of accumulation c. 0.6 m) exposed a one-period site of the Pre Pottery Neolithic A (hereafter PPNA). During the excavation, a systematic survey revealed that the distribution of artifacts extended over an area of c. 2400 sq m (Fig. 2). The original size of the site can not be estimated due to modern construction and post-depositional disturbances. Yet, the excavated area can be roughly estimated to represent about one third of the site in its current state of preservation. Stratigraphically, the site comprised three main archeological units. The first unit (thickness c. 0.1–0.2 m) rested upon the bedrock. The majority of archaeological material in this unit was found in pristine depositional context. The second unit was a clay layer with moderate amount of archeological finds (thickness 0.1–0.2 m). The third and upper unit was disturbed plough-zone topsoil (thickness 0.2–0.3 m). 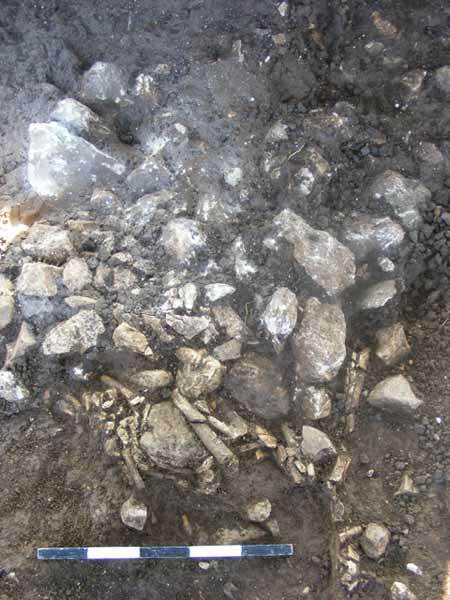 An important find at the site was a multiple burial of two individuals. The small faunal assemblage at the site included mainly small game species. The raw material sources from the Timrat Formation of the Lower and Middle Eocene, consisted of large blocks and nodules of dolomite, limestone, flint of various sizes and morphologies exfoliated from the bedrock. Another important source for flint knapping was the previously worn and modified lithics that was reused by the inhabitants of the site. Three excavation areas (A–C) were distinguished according to variations in the spatial configuration of angular fragments, the artifacts’ density and lithic affinities. Area A (18 sq m) was the western most part of the excavation. Its stratigraphy complied with that of the general site. The angular fragments in this area formed two continuous horizons; the first was exposed over 12 sq m at least, as it continued to the north, south and west. The density in this horizon was c. 350 angular fragments per 1 sq m, having a thickness (c. 0.1 m) of a single fragment. Three meters apart was a smaller-sized horizon (c. 3 sq m), wherein a burial was uncovered (Fig. 3). 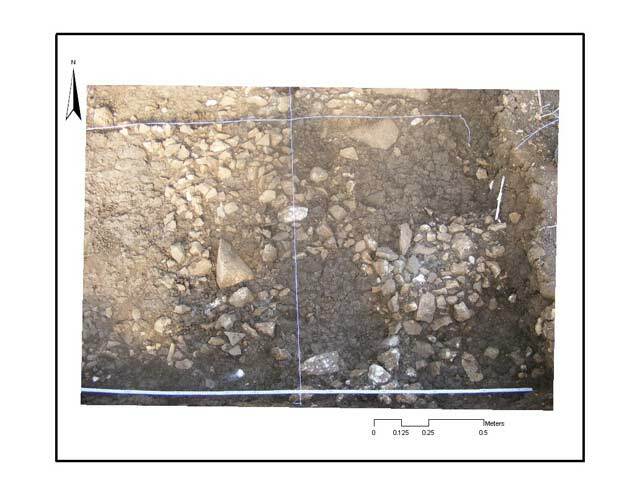 The stony layer contained few animal bones, clay lumps and a rich lithic assemblage (Tables 1 and 2). 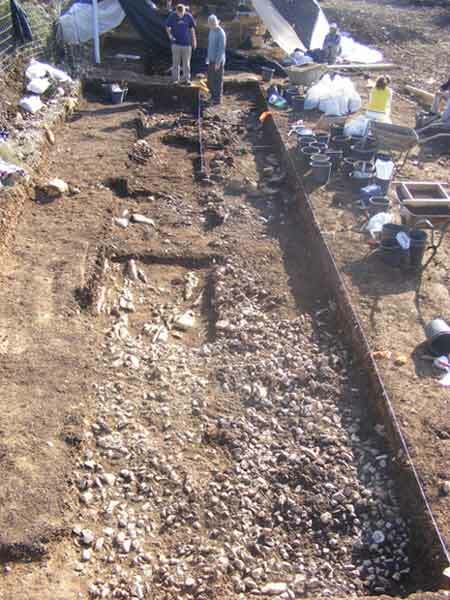 The burial (MNI=2) in the second continuous horizon had a large and long triangular slab (length c. 0.4 m) placed at the bottom of the grave. The first individual is 10–15 years of age, of unknown gender and the second is probably a woman of c. 20 years of age. The burial is represented mainly by long bones without the skulls, which have been removed in antiquity. The burial is a secondary burial (Fig. 4). Three complete ground-stone tools were found adjacent to the burial. These included a complete pestle and two basalt hand stones (Fig. 5). Since no similar finds were discovered in the other excavation areas, it is suggested that these ground-stone tools served as burial offerings. Area B (11 sq m): The angular fragments were missing here and the only lithics were recovered mainly from the layer (thickness 0.1–0.2 m) above the bedrock. Area C (6 sq m): The stratigraphy in this area complied with the general site’s stratigraphy. The stony layer is manifested in relatively low density patches (c.150/sq m), without any clear spatial patterning (Fig. 6). Only a few animal bones were found with the angular fragments, as well as minute frequencies of clay lumps and a few broken ground-stones. The lithic assemblage recovered from the excavation is dominated by flake production, both in debitage and in the tool component (Tables 1 and 2). Another important aspect of the assemblage is that in all phases of the bifacial reduction sequence, including the distinctive tranchet spalls, typical of the PPNA, are present at the site, mainly in Area A (Fig. 7). Diagnostic PPNA tool types are two Salabiya points and a single el-Khiam point. The tool repertoire also included retouched flakes, burins and sickle blades (Table 2). The identified animal species included gazelle (Gazella gazella), wild boar (Sus scrofa), cape hare (Lepus capensis) and a fox (Vulpes vulpes). The site of Bir el-Maksur is the only PPNA site that has been excavated in the Galilee. The position of the site within the settlement pattern of the PPNA is intriguing. On the one hand, no substantial architectural remains were found, only paved surfaces. 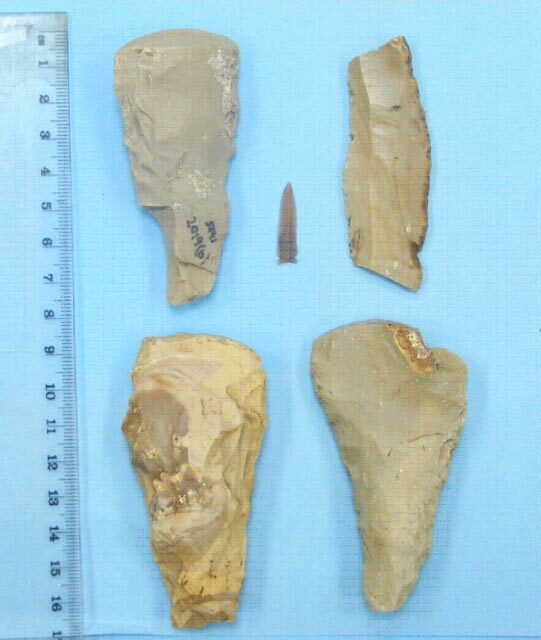 Yet, on the other hand, the lithic assemblage reflects varied activities, as it contained not only bifacial reduction sequence, but also sickle blades—evidence of plant processing resources, and a very diverse tool repertoire. The burial adds yet another complexity to the question how ephemeral was the habitation at the site. The results of the excavation contribute new data concerning subsistence strategies and settlement patterns of the Pre-Pottery Neolithic A period in the Galilee. It is particularly important due to the absence of sites from this time span in the region. 1. 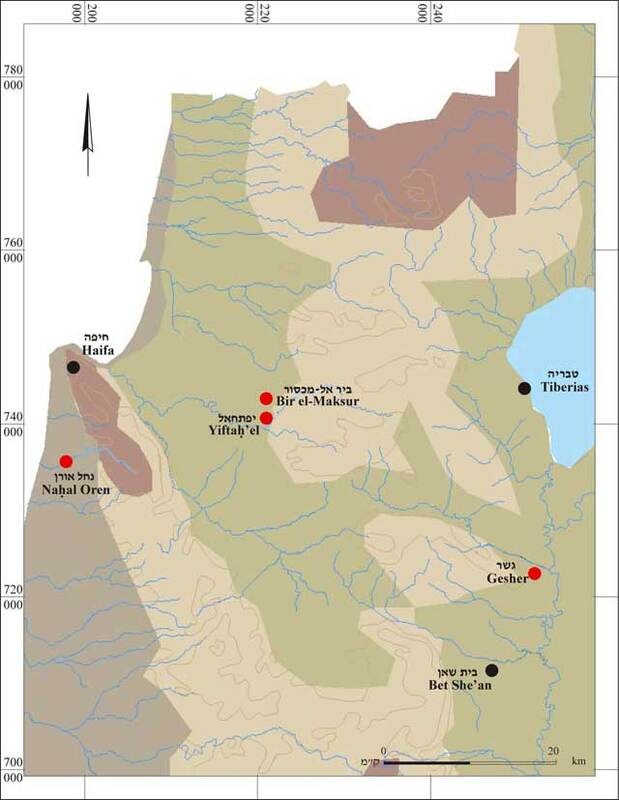 Location map of Bir-el Maksur and other PPNA sites. 2. Location of the excavation areas and test pits. 4. General view of the burial, looking west. 5. 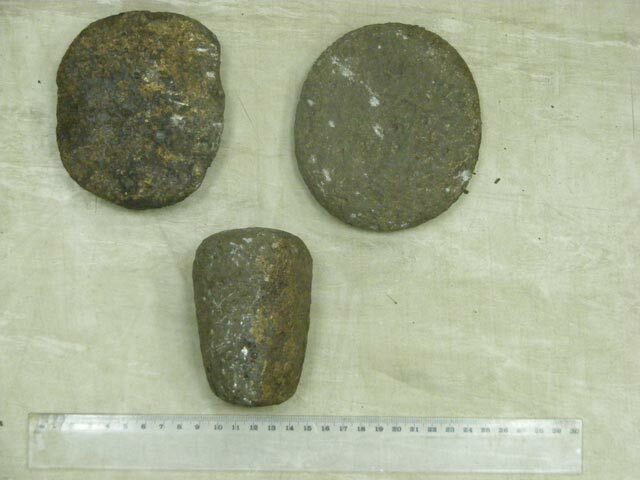 Area A, pestle and two hand stones from the burial.